An opportunity given can change a person’s future. I was in the “Normal Technical” stream during my secondary school years. The subjects studied are of basic level and students from this stream are not eligible to sit for GCE O Level examinations. Initially, I thought the only way I could further my education was through the Institute of Technical Education (ITE). However, MDIS gave me a chance to attain a GCE O Level Certificate which shortened my academic years in ITE. Everyone around me thought that it was impossible for me to enter a polytechnic. I was accepted into Republic Polytechnic and graduated with a Diploma in Information Technology. MDIS School of Technology offers the Bachelor of Science (Hons) in Computer Security in collaboration with Northumbria University (UK). The modules offered in this programme are relevant to the specialisation I took in polytechnic. I decided to make a return to MDIS for my Bachelor Degree. MDIS is equipped with well-furnished computer labs, lecturers with many years of teaching experience and staffs that are very kind and helpful. I would like to thank MDIS and Northumbria University for giving me the opportunity to achieve my dream. My student life in MDIS is wonderful. One benefit of studying in a private school is getting introduced to new friends and lecturers from various countries. The projects and assignments that I am assigned to do are all of high standards. I was introduced to MDIS by my cousin. I did further research on MDIS and the courses offered via the internet. 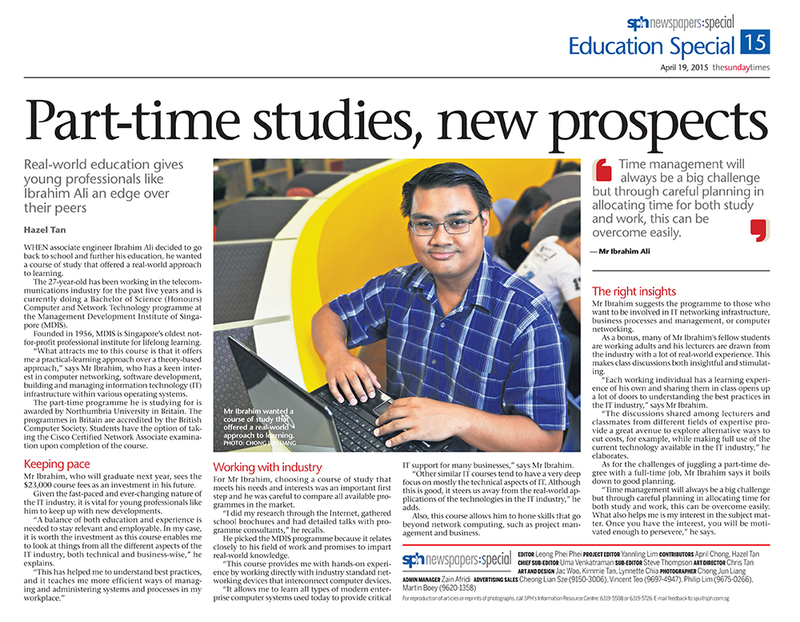 Before I joined MDIS, I was studying in ITE. During my days studying there, IT has always been my area of interest. I love to explore the inside of a computer and explore different applications and programs on the internet. 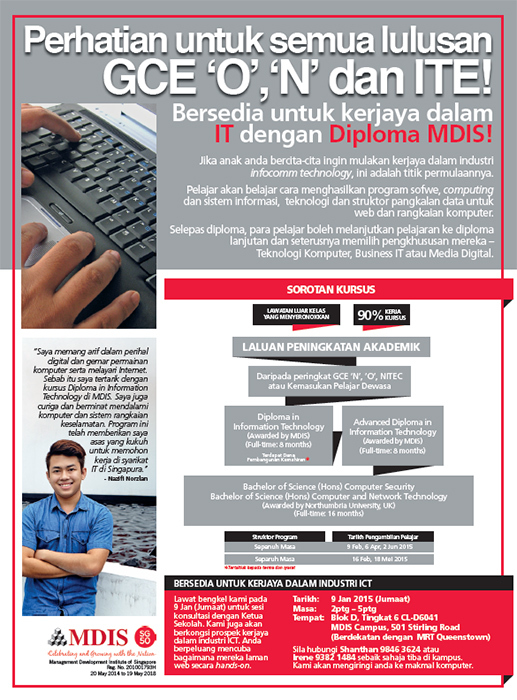 I decided to pursue my Diploma in Information Technology in MDIS. It benefitted me to a great extent. I upgraded myself with an Advance Diploma in Information Technology and eventually enrolled myself in Bachelor of Science in Computer Security. 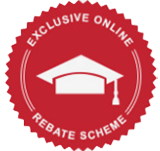 MDIS is unique from the other institutes as it offers students with a progression study; from Diploma to Advance Diploma and then to Degree. I chose to study in Singapore because I am Singaporean. I will get the benefit of studying in my own country while obtaining a degree from a respectable overseas university. Upon graduation, I hope to get and IT based job that focuses on computer security. The modules are beneficial to me. I hope to pursue my Masters while working. Earning a degree is my dream. I am halfway through the process. It will definitely open up opportunities in life. MDIS has prepared me with the necessary skills. I am ready for working life! MDIS offered me a holistic university like education environment with both onsite classes and e-learning ; with lab facilities , library and many more similar to any other international university. A good team of lecturers, professors and experienced seasoned industry experts; together with a well prepared curriculum plan from MDIS School of Technology have contributed a lot to preparing me for the programme. I believe the education I received in MDIS; both the advance diploma and degree programme will lead me ahead compared to other graduates due to the specialist nature of these courses. Studying in MDIS is one of the best experiences I have ever had. I made a lot of friends from different countries and had lots of fun. I had always been interested in technology since I was a kid. I believe technology will keep affecting our lives. This is one of the reasons I choose IT as my Advance Diploma course in MDIS. The seminar about “Cyber Security” presented by Interpol inspired me to take Computer Security as my degree course. The course taught me how to become an ethical hacker and prevent hacker attack. The school is equipped well-furnished computer labs. I really enjoyed studying at MDIS. My sister-in-law, who had studied here previously, was the one who recommended that I leave Vietnam to pursue my tertiary education here, and I am glad that I chose to take her advice. Not only has the institution allowed me to take my Diploma and Advanced Diploma in Information Technology (IT) at an accelerated pace, it has also taught me a lot about the industry as a whole. As someone who deeply enjoys creating digital art through multimedia channels, the Diploma has really opened my eyes. Through industry visits that keep us up to date on the latest trends, friendly lecturers who made learning simple and clear for me, and a flexible study schedule, I now have the skills and knowledge required to step into the working world. Upon graduation, I intend to look for a job in Singapore doing advertorial and advertisement design for digital marketing. Should the opportunity present itself, I also intend to pursue further education in MDIS simply because I enjoyed the experience so much. My MDIS experience has been wonderful. Not only have I gotten to meet and know many new friends from a wide variety of countries, the cultural melting pot that is the MDIS campus has proved to be an invaluable source of experience. After hearing the good experiences that my siblings had with MDIS, I decided to pursue my Diploma and Advanced Diploma in Information Technology (IT). As an amateur Java programmer, I was also interested in further honing my skills, and MDIS proved to be an excellent platform for that. The school has many very well-furnished computer labs, and the lecturers made complex topics like programming extremely easy to understand. I am glad that I chose to study here, and look forward to starting my career as a mobile app programmer and developer upon graduation.